I have used the cash envelope system for 16 months now, and I will never go back! 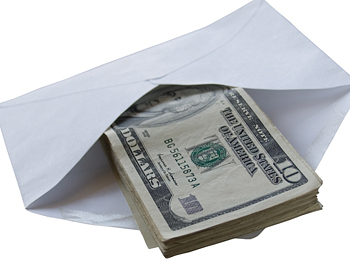 The cash envelope system is a great way to get a hold of your finances. It gives you control over your money and allows you to tell your money where to go. In 16 months, I have paid off $42,000 in debt using this system (I am not kidding). Studies have shown that when we spend cold hard cash on an item, pain centers go off in our brain; it is hard for us to let go of our money! These same pain centers do NOT go off when we swipe a piece of plastic. By creating a cash and envelope system, we literally see that money is FINITE; there is an end to it if we are disciplined about not borrowing more. By using cash only in envelopes, I have slowly changed my behavior and attitudes towards money. In addition to paying my debt mentioned above, I have come to the clear realization that money is FINITE. Without the aid of credit, we have a limited amount of funds, and we need to be extremely aware of this fact. The cash system is linked directly to the budget that you will be creating; some of your budget lines will be automated (mortgage, rent, insurance, etc.) and some will be “cash lines”. These budget lines, like food, gas, eating out, coffee, etc., are the categories where you can really start being frugal and responsible with. They are also ones that we traditionally don’t know how much money we spend on! I will say that I have turned my finances completely around after being aware of (and controlling) my “eating out” budget line. Your envelope system can be homemade or a little more fancy, it is up to you. Basically, you want to be able to label each envelope and be able to carry it around with you in lieu of a wallet. There are not too many systems on the market, so shop around accordingly. I bought Dave Ramsey’s envelope system, which has worked very well. Write down the name of each category on each envelope. For the first two months, I wrote the amounts of each transaction on the envelopes as well. By the third month I got the hang of things, and I was aware of how much money I habitually spent on each category. Your budget should dictate how much cash you put in each envelope. Getting the money right for each category will take a couple of months of trial and error. Then do the same for the different envelops you have created. When you run out of cash in an envelope, it is gone! You cannot go to an ATM and fill it back up. No cash in the “eating out” envelope? Guess you are making lunch and brown bagging it! It has been so incredible to watch my bank account stay the same each month since I do not use debit. On any given day I can tell you what my balance is. My wife and I have a budget meeting at the end of every month to go over our finances together. When you are using the envelope system, it can be extremely helpful to have a goal that you are trying to meet. When we started using it, we wanted to pay off a specific amount in debt. Any extra cash that we had left over at the end of the month went toward our goal: paying off debt. Keeping specific goals in mind helps us keep up motivation to stay within our budget. My budget has been overhauled after using the cash envelope system. My family has easily saved $400-$700 a month on stuff like food, wine and gas and we do not feel like we have sacrificed anything. I will use the system forever!